Welcome to Bigger Picture Moments, a place where we step back and take in the SIMPLE things in life. Simple moments in the mundane or in the hectic that take our breath away. A picture maybe? A poem? A gesture of kindness or things we unwrap during the week. We encourage you to take this opportunity to take a moment and view the Bigger Picture. Whatever that means to you. Whatever way you want to outlet that in your blog. We hope you’ll join us. Take a few moments. Think about your week, and pour however little or much onto a page. Then share. Tell us your moment. Link up at Alita's grab our button, and share your Moment. She was born one year and one week after we lost him. 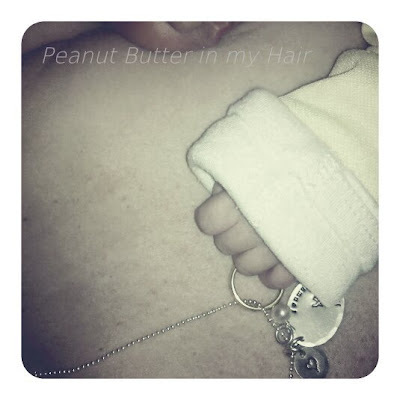 I wore a necklace to her birth with his name on it. I wanted him to be a part of our growing family, to be remembered and not forgotten. Since her very first moments she has reached for that necklace. She holds it in her hands while she nurses. Gently making the pearl jingle the charms. She is connected to him. My angel in heaven and my angel here. I can feel that. Tiny little hands, reaching out. Connecting and healing my heart. That's my Simple Moment this week. What's yours? How precious, how sad, how bittersweet. You are healing and loving, and this little one is helping in the process. very touching. I know the pain. My first pregnancy was a girl, and we lost her. I had three boys to follow, but that pain is still there. I never had a girl like I always hoped for. But my three little guys are beautiful and amazing, and I am so glad for them. hugs to you. That is so sweet. I just love those little baby fingers. This is SO beautiful, Mel. She is so precious in so many ways, friend. And so are you. This is so so beautiful Melissa. I remember your experience and seeing this picture brought tears to my eyes. Oh this is just beautiful. So tender. This really touched me, Melissa. Simple, but beautiful and soul-moving. A perfect circle. This gave me chills. What a wonderful way to honor your boy. oh melissa. this is amazing.